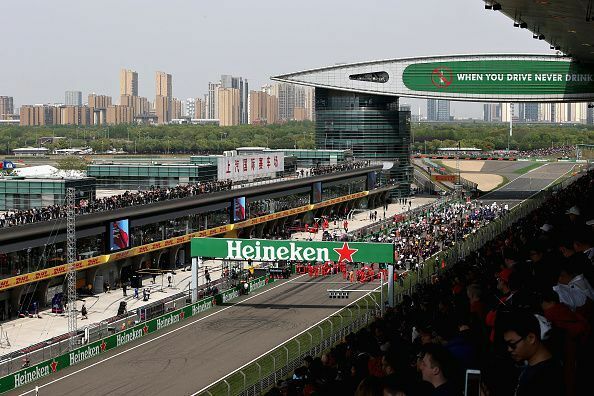 The Chinese Grand Prix is a Formula One World Championship race held at the Shanghai International Circuit at Jiading in Shanghai. The track was designed by renowned maker Hermann Tilke. At the time of completion, it was the most expensive track, costing US$240 million, a tag it held until 2009, before Abu Dhabi became the most expensive at US$6 billion when it opened. The track is 5.451 km long and features one of the trickiest corners combinations on the Formula One calendar, comparable to that of Istanbul's turn 8, also designed by Tilke. Turns 1 and 2 are a technically demanding 270-degree, right-handed corner combination that requires a lot of speed whilst entering as it tightens up towards the end. The race is contracted to be held at least until 2020. Brazilian Rubens Barrichello won the inaugural race in 2004 in his Ferrari. In 2005, it was the final round of the Championship, where newly crowned World Champion won the race handing Renault the Constructors Championship. In 2006, Michael Schumacher won the race - his last ever race win in Formula One. In 2008, it was rumoured to be removed from the Formula One calendar, as it was reporting losses year after year. It stayed on, and after much speculation, it extended its stay in Formula One until 2017. A subsequent 3-year extension in 2017 has it scheduled to be a Formula One host until 2020. It is also set to be the host of the 1000th round of the Formula One World Championship. Lewis Hamilton has 5 race wins to his name at the venue, making him the most successful driver at the Shanghai International Circuit. Fernando Alonso and Nico Rosberg have 2 wins against their names. Mercedes has been the most successful constructor with 5 wins under their belt. Ferrari has 4 wins, and Mclaren, which hasn’t seen a win here since 2011, has 3. Are Chinese drivers making a foray towards F1? F1: Highlights of the Red Bull-Renault Partnership, as Honda takes over next season.